Soups don’t have to be just for cold weather. 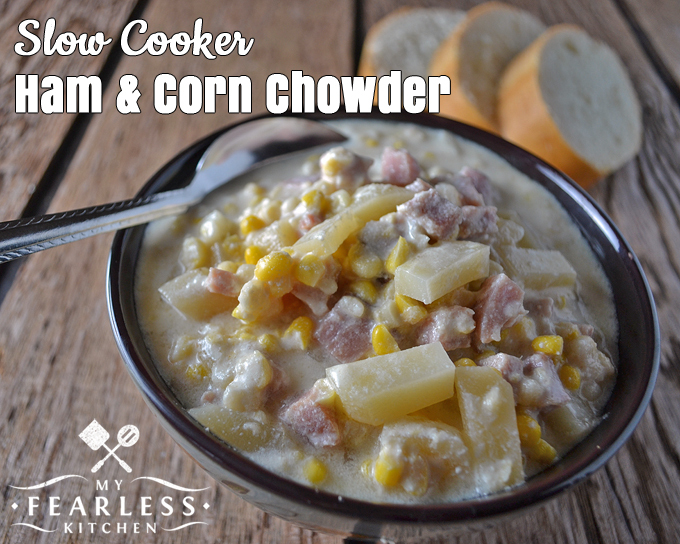 No matter what time of year it is, Slow Cooker Ham & Corn Chowder is always a good idea! One of the great things about living in the country – smack dab in the middle of 40 acres – is that we have plenty of space to expand our garden if we want to. When the opportunity came around to plant a tenth of an acre of GMO sweet corn, you can bet that we jumped on it! 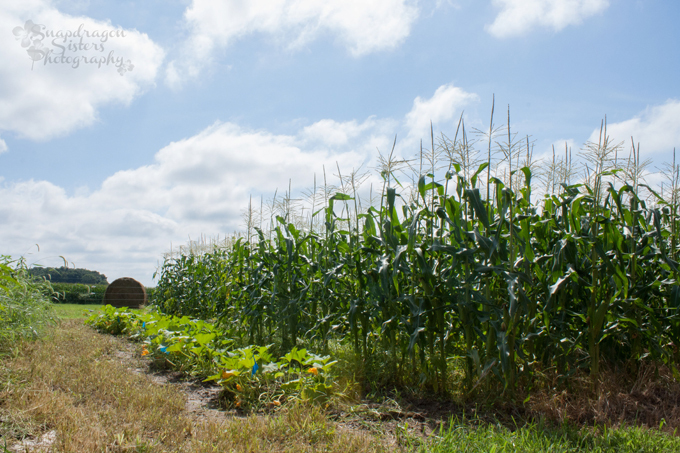 So this year, we raised cattle, grew hay, and grew sweet corn! 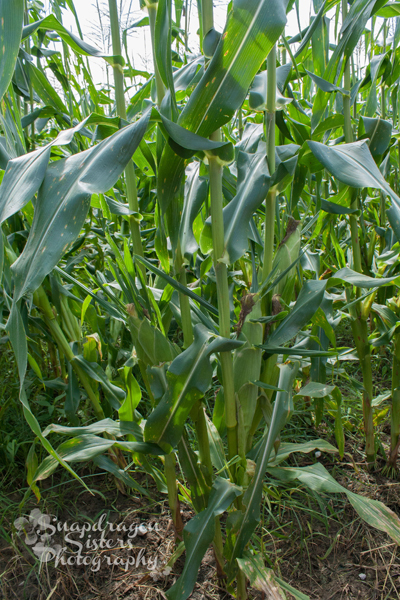 This corn was resistant to Roundup, to some worms that can bother the roots of the corn plant, and to some worms that can eat the ear of corn. So we had a good way to control the weeds in our sweet corn patch. (And good thing, too! Check out all the weeds we had to battle in this post.) The corn plants were healthy because no worms were bothering their roots, and the ears were plump and tasty because no worms were trying to eat them. That’s a row of pumpkin plants in front of the corn in the photo above. And a nice patch of weeds where our green beans were supposed to be. Darn the composted cow manure fertilizer and all its weed-growing capabilities! The corn silks are the fine hairs that poke out the top of the corn husk. 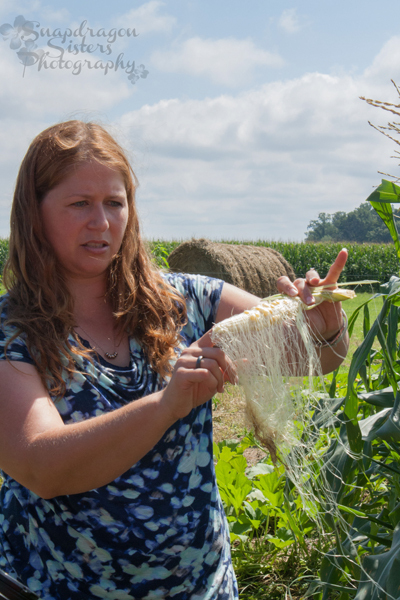 Did you know that every kernel of corn has its own silk? The pollen from the corn tassel (at the top of the plant) falls down onto the silks. This fertilizes the silks, and makes the kernel form. Once the silk is fertilized and the kernel is starting to form, the silk detaches from the corn cob. They still seem to be “stuck” when you clean your corn because the are caught between the developed, plump kernels of corn! Enough about growing the corn… let’s pull some out of the freezer and eat it! We eat tons of corn on the cob all summer long. And we freeze a bunch of sweet corn to eat the rest of the year. There is so much corn in my freezer, I’m always on the hunt for more recipes to use it all up! 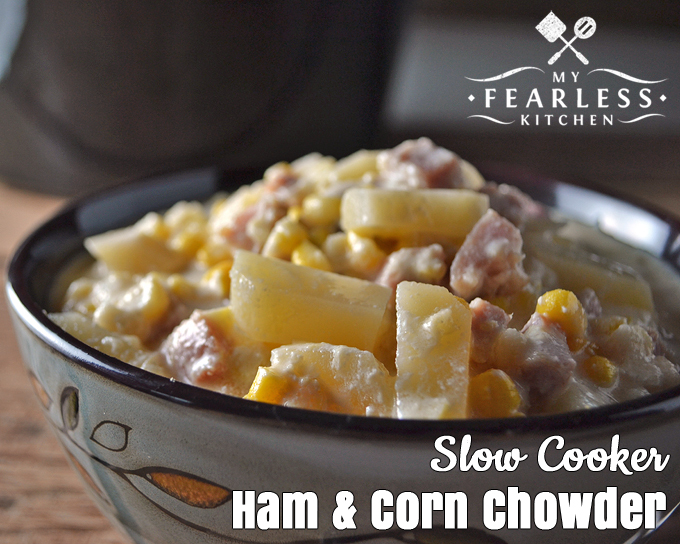 This Slow Cooker Ham & Corn Chowder has it all – corn, ham, and potatoes. I adapted this recipe from one in “Autumn in a Jiffy” by Gooseberry Patch. And slow cooker?! Hello! That’s my favorite part! If you don’t have a freezer full of sweet corn, you can use canned corn instead. Whichever type of sweet corn you use, do not drain it before you add it to your soup. You’ll want that tasty brine to add liquid and flavor to this soup. You’ll also need half an onion for this chowder. Onions are fast and easy to chop, if you know how to do it. Check out this post to get the details on the easy way to chop onions. If you’re looking for the Instant Pot version of this recipe, you’ll find it here! What’s the Difference Between Sweet Corn and Field Corn? Soups don't have to be just for cold weather. 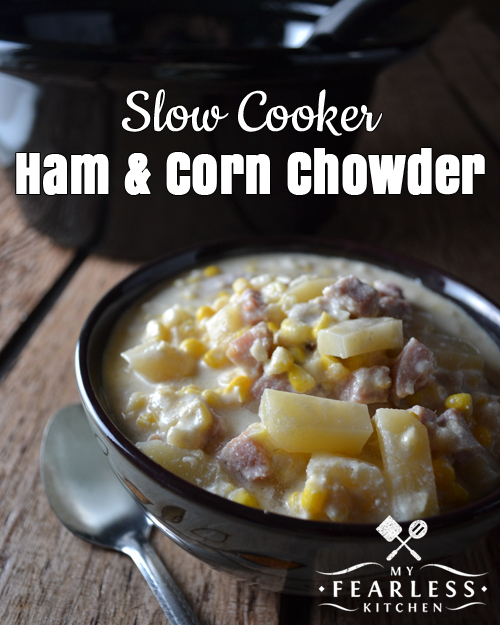 No matter what time of year it is, Slow Cooker Ham & Corn Chowder is always a good idea! Melt butter in saucepan over medium heat. Add onion and cook until tender, stirring frequently. Add flour, whisk to make a paste. Slowly whisk in broth, stirring until smooth. In a 6 quart slow cooker, combine potatoes, corn (not drained), ham, and half-and-half. Add broth mixture and stir to mix. Cover and cook on low for 6-8 hours, until potatoes are cooked. Hi, can not wait to make this – I love soups. And of course potatoes and corn are a few of my fav veggies. Wanted to ask you: Have you ever planted “silkless corn” – my sister’s husband found the seeds and planted and they were the BEST corn I have ever eated – everytime I went to my sisters and she was cooking – she’s say “stay and eat” and I’d say “R U having corn” and she said “well, I sure can” – though she’d always have all pots on the stove cooking other veggies. Anyway, see if you can locate the seeds up your way and try them next year 0- you will not be sorry you did. You will not want any other kind afterwards – especially just to eat by themselves. YUMMY. Will try your soup. I haven’t tried “silkless” corn before, sounds delicious! And a great option for people who hate to get those stray silks stuck in their teeth! Thanks for the tip. trying to change so I will get notification when someone replies to my comments. I forgot to check that.